Yates’ Sheikh’s Desert Duty, part of the elaborate, convoluted and to Miss B uninteresting Chatsfield series, opens with Sheikh Zayn Al-Ahmar of the desert kingdom of Surhaadi and James Chatsfield. James is the nasty who has dishonoured Zayn’s sister, Leila, by abandoning her pregnant. When Zayn calls James out for his actions, James responds, ” ‘You’re positively biblical, Al-Ahmar.’ ” Zayn is all about the old-fashioned virtue of protecting his family and country. When Zayn leaves London’s Chatsfield Hotel, he discovers Sophie Parsons lurking among the garbage cans. Sophie, in turn, is there to help out a friend, Isabelle Harrington, whose family hotel business is threatened by Spenser Chatsfield. As a reporter, Sophie hopes to find some delicious Chatsfield scoop to use in aid of her loyal, loving friend. What she finds instead is a tall, dark, handsome stranger, who assumes she’s going to snoop around long enough to expose his sister’s dilemma. To protect his sister’s and country’s reputations, Zayn kidnaps Sophie. Sounds awful? In premise, yes, but Yates is a clever and tongue-in-cheek writer when she’s at her best. Evidence: James’ cool, sly “biblical” retort to Zayn’s sombre, serious need to protect his family. Zayn: the desert patriarch, the tribal leader under whose wings everyone is succoured. One of the ways that Sheikh’s Desert Duty worked for Miss B. is Yates’ ability to balance pathos with bathos. This sheikh guy KIDNAPS a woman … puts her in his car, takes her to the airport, ignores her wishes. You get the picture and it’s an unsavory one. Yet, the humour, the little downturn to ruefulness that the dialogue takes had Miss Bates smiling along with this godawful premise. Witness Zayn’s discovery of, and ominous threat to, Sophie when he finds her: ” ‘How much did you hear?’ Her eyes, which were already quite wide, widened further. ‘Nothing of interest. I was actually quite bored. I was actually taking a nap.’ ” Sophie’s bravado and wit win the day over Zayn’s melodrama. In turn, her thoughts in Zayn’s car on the way to the airport (his jet is private of course, this is an HP): “She eyed the speedily passing scenery and considered doing a tuck and roll. ‘The doors are locked.’ It seemed he was a mind reader in addition to being a kidnapper.” Sophie’s irrepressible spirit of humour and chutzpah, her ability to go along with her predicament yet take a sarcastic stab at it make the narrative convincing. Melodrama undermined and Sophie’s wit carries us along. Once Zayn and Sophie arrive in Surhaadi, like the irony romance cannot sustain, the bathos dissipates as well. The hero’s near-villainous larger-than-life-ness is mitigated, not only for the heroine to be attracted to him (this is evident immediately: he’s quite the specimen), but to love him, for him to be worthy of her love. Zayn has to make a claim to ordinariness: ” ‘I am simply a man. Doing what I must to ensure that my family remains safe.’ ” Zayn’s love and sacrifices for his family humanize him. Sophie’s chutzpah and irrepressible nature are mitigated by her vulnerability. Thrown together in the palace, Zayn and Sophie learn about each other. In the de rigueur “I’ll show you my desert” scene, Sophie tells Zayn about her neglected childhood, with a mother clinging to a rich, influential man who cared neither for the woman, or daughter on the sidelines of his life. Zayn too has had a hard time of it: with his dissipated youth and loss of a family member giving way to a stiff and puritanical man, who relinquishes all joy to the twin cause of family and country. Sadly, this is where Yates’ romance loses steam: initial banter succumbs to long, heartfelt sharing conversations, as if Yates only had impetus for the initial fantastic set-up and witty exchange and then pfft. The great action of the first chapter turns languid, then static. Bathos dissipates like Zayn’s prodigality and Sophie’s virginity. Pathos on the other hand stands strong with Sophie’s orphan love absolving Zayn of guilt, setting him free to love her. Despite these flaws, Miss Bates enjoyed Sheikh’s Desert Duty. She liked Sophie and Zayn; she felt for them. Sophie’s affection and humour, her ability to be honest about hardships without whinging, were endearing. Zayn, in spite of his initial actions, was a decent man, one who wanted to do right by his responsibilities, treated Sophie with respect and consideration. No He-Man posturing. He was kind; he asked her permission; he cared about the consequences of his actions. There was a hurried, contrived dark night of the soul moment when Sophie and Zayn were torn asunder, but heroine and hero had suffered long enough. It was lovely to see their HEA. Overall, Miss Bates found in Maisey Yates’ Sheikh’s Desert Duty a romance that was “almost pretty,” Northanger Abbey. 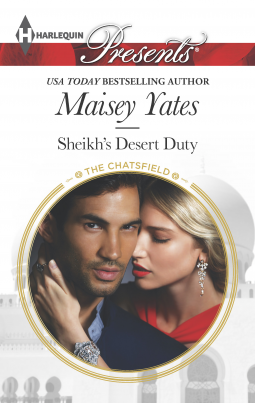 Maisey Yates’ Sheikh’s Desert Duty is published by Harlequin and has been available since December 16, 2014, in the usual formats and vendors. Miss Bates received an e-ARC from Harlequin, via Netgalley. I read one of the Chatsfield books (by Lucy Monroe, I think) and didn’t think much of the premise of the series, so I’ve avoided them since. I find those Harlequin continuities either really work well (The Notorious Wolfes) or not at all. But maybe I’ll try this one. Yup, I agree: the continuous series just frightens me. So much to keep up with and what if I don’t like one of them. I thought this was an improvement on the last one: it doesn’t reach the heights of Pretender To the Throne, but the heroine and hero are most fleshed out and appealing.